I've always had an interest in human psychology and why we as humans do what we do. Once I became a widower, this interest only intensified. Grieving is not a uniquely human experience by any means, but it is certainly one of the most intense, if not the most intense, human experience. As the intensity of my grieving picked up, I started consuming books about psychology and grief. I wanted to know: Why do we grieve? Why pain? What is the purpose of grieving? How long will this go on? My thought process at the time was, if I can understand why I am going through this living hell, then I can find the Grief Recovery Tools I need to help get me out. I have previously mentioned The Sedona Method , a super-important book that I feel strongly every widow/er should have in their Grief Recovery Toolbox. This book will lead you through the maze of your emotions and help you to release them all. Big promise, yes, and it certainly delivers. If we wanted to fell these imaginary trees of limitation and clear a path through this imaginary forest by releasing, there are several ways we might go about it. We could let go of one atom at a time by working to change our thinking. But that would take a long time. We could be even more active and proceed by plucking off individual leaves (feelings). But leaves tend to grow back. 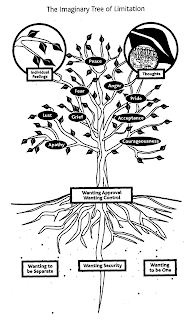 Or we could start pruning the branches (the nine emotional states). If you've ever pruned a tree, however, you know that branches often come back healthier than before. We would only start making significant progress once we began chopping at the trunk and lateral roots (the wanting approval and wanting to control). Of course, many trees have grown back from stumps even after some of their roots were removed. There is not much certainty of eliminating this imaginary tree until we set about severing its taproot: wanting security and its opposite, wanting death. Now remember, in the forest of limitation where you're lost, every tree is imaginary. All limitation is imaginary. At any point in this process, you can get a glimpse of what lies beyond the trees, the background of perfection and infinity that supports yet is unaffected by the forest. So, allow for the possibility as you use the Sedona Method that big chunks of the forest itself can fall away. Often, when you least expect it, you'll let go of big chunks of your imaginary limitation quite spontaneously. This will happen more and more frequently as you release at the level of the four basic wants. The entire book is The guide for releasing and letting go of your emotions. Now that I am re-reading it, I can see how well it dovetails with Vipassana meditation and Eastern Thought in general. Why my interest in Eastern Thought? Simple: in the West, all advice to the bereaved is, "learn to live with your pain — it will be with you for the rest of your life." In the East, the advice is different: "Learn to let go of all your emotions, needs, and desires, and experience real peace." It should be clear which advice I chose. You do not have to feel this pain forever. You can let it go. And it is easier than you think.